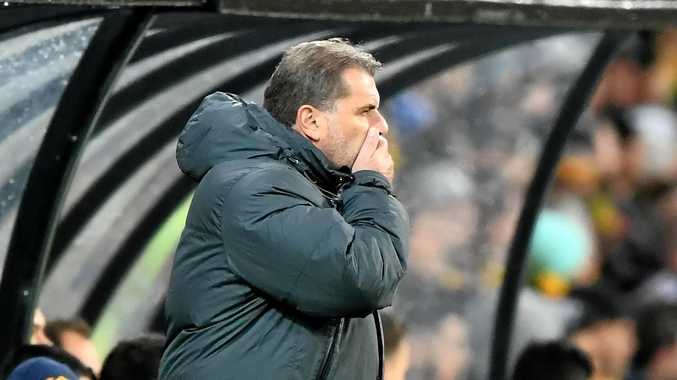 AUSTRALIAN football legend Mark Bosnich has launched an astonishing attack on Socceroos coach Ange Postecoglou following his side's 2-1 win over Thailand in Melbourne. The Aussies headed to AAMI Park third in their World Cup qualifying table level on points with Saudi Arabia, whose goal differential was two better. The men in gold needed goals and lots of them to make up that deficit, but despite completely outplaying Thailand in every facet scoring proved hard to come by. 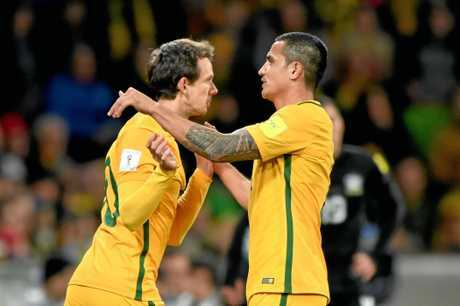 Australia needed Japan to defeat or draw with the Saudis early on Wednesday morning to guarantee safe passage through to Russia in 2018. But the Saudis secured a 1-0 win leaving the Socceroos with a much tougher journey to the game's showpiece event. Bosnich slammed Postecoglou in the aftermath for his arrogance in treating the national side as his personal guinea pig. He said becoming involved in an ugly spat between Football Federation Australia (FFA) and Professional Footballers Australia (PFA) had soured the coach's outlook on his job and clouded his judgment. 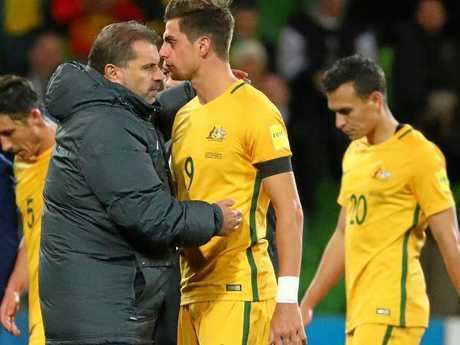 Postecoglou consoles his players after the narrow win over Thailand. "There's something further at play. There was a clash between the FFA and the PFA. Ange said something to try and calm the situation and he got slapped down publicly (by his employer the FFA)," Bosnich said on Fox Sports. "Since that day he has not been a happy man. "Whatever issue he's had with the FFA it seems he's taken that out on everybody." The ex-Manchester United and Chelsea goalkeeper said the weird feeling after Tuesday night's match - where the home side's players were obviously distraught at having missed a golden opportunity to put plenty in the back of the net - is the result of Postecoglou's constant, unnecessary tinkering during the entire qualifying campaign. "It wasn't just about tonight. This has been about all those games," Bosnich said. "This didn't start here tonight - this started eight or nine months ago when the manager started tinkering with the system and now we find ourselves in a position where we're relying on something else to qualify automatically. "He (Postecoglou) apparently told people that were there (to see Australia draw 1-1 with Iraq in March) what he was doing, saying, 'We're looking forward to the World Cup.' Qualify for the World Cup before you start thinking about things like that. "If you'd qualified before tonight you could have gone out and experimented. Don't be using the national team as an experimental laboratory. It's not there for that, it's too important for that. "The game in this country needs us to qualify (for the World Cup) all the time. It's not to be trifled with, not for your own, 'I can do this' or 'I can do that' (attitude). "He's hanging by a thread and if we go through a playoff route there needs to be serious consideration of another voice because those players in my opinion, regardless of what they say publicly, are not responding to him like they used to." Bosnich further questioned Postecoglou's tactical capacity to lead the team any longer, pointing to his determination in continuing to use three men in defence despite the teething problems that switch has brought with it. "I've always debated with Ange that you should always have a plan B and a plan C if you need to. But he always used to say to me, 'No, my plan B is to do plan A better,'" Bosnich said. Ange Postecoglou reacts to Socceroos loss: Coach says he is the one to carry any blame.